Boulder City’s Chandler Harkins recorded his best time ever over the 3.1-mile course at Veterans Memorial Park to finish in third place Oct. 12 in the Lake Mead Invitational. It is the largest cross-country meet in Nevada this season. Harkins ran 17 minutes, 27.6 seconds to finish behind Tech’s Martin Ponce (17:01.7) and Faith Lutheran’s Chase Wood (17:15.2). “We had some real good efforts from some of the boys and girls in the Lake Mead Invitational, which is a preview of what’s to come at state from the south region runners,” cross-country coach Canaan Petersen said. The boys Division 1-A race, the Eagles finished fourth with 83 points, behind Tech, which scored 37 points, Faith Lutheran and Clark. Boulder City’s Evan Klouse was 16th with a time of 18:55.5, followed by Caleb Shamo (19:10.8) in 19th place and Joren Selinger (19:19.7) in 20th. The boys finish was behind Tech, Faith Lutheran and Clark, which are all in the Southern Region meet Nov. 2 on the same course at Veterans Memorial Park. “We need to beat one of them in the region meet in order to qualify our team up to state,” Petersen said. In the Lake Mead Invitational’s girls competition, Lady Eagles runner Jessica Embro ran 22:28.5 to place eighth behind champion Bailey Gosse (20.28.5) from The Meadows. Emma Torgeson (24:15.9) was 18th and Niquel Nussear (24:24.4) was 21st. “At this point, we need to not only think about the team effort at qualifying for the state meet, but also think about the individual efforts that will earn the girls a trip to the state meet,” Petersen said. After the first three teams and its runners qualify for the state meet, the next five individuals can qualify based on times. “I believe we have several that can be in the mix for those entries. Chandler had his best time ever on the course,” Petersen said. “He ran well, but he has more to give. He will be working hard in practice for the next few weeks in order to achieve his ultimate goal of not only winning the region or state championship, but to secure his first time ever under 17 minutes. The boys and girls cross-country teams have no meets this week as they prepare for the Sunrise League Championships on Oct. 25. On Oct 8, the two teams had a dual meet against Moapa Valley while racing six other Sunrise League teams in Overton. In the boys race, Harkins (18:50) was fourth, Klouse (20:08) was eighth and Christian Shamo (21:09) was 12th to lead the Eagles. With the dual-meet win, the Eagles finished the regular season with a 5-1 record. 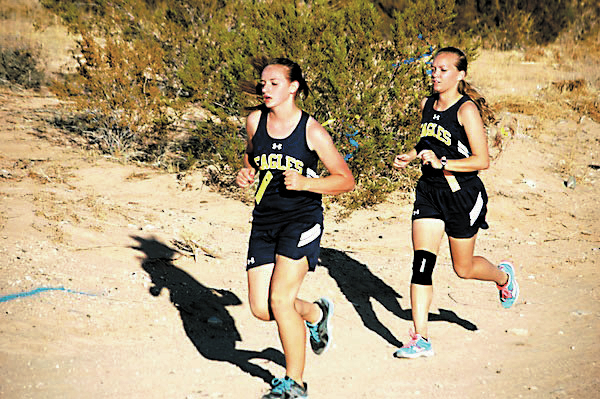 Against, Moapa Valley, Embro (24:36) was fourth, Torgeson (25:14) fifth and Nusseur (26:31) ninth as the Lady Eagles ended the dual-meet regular season with a 4-2 record. Sabrina Snow ran 29:28 and Maddie Sargeant ran 28:21. “The lone loss for the boys was to Tech, which is one of the favored teams in the playoffs,” Petersen said.